In the study of the winter-light crop, 18 kilo of cucumbers have already been harvested with 30% lower energy consumption than in practice. This is the outcome of research in the 2SaveEnergyGreenhouse in the Innovation and Demo Centre for Energy (IDC energie) in Bleiswijk.. In the winter, light is the limiting factor for production. 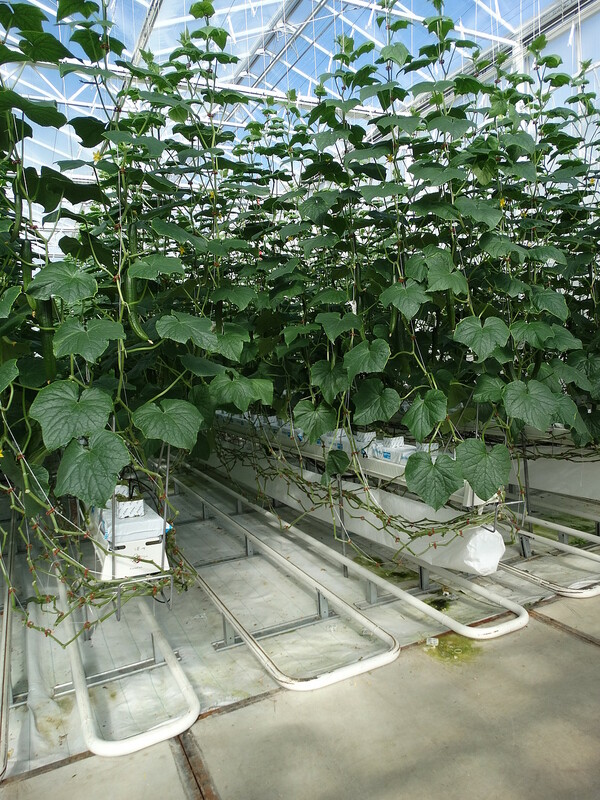 The Kas als Energiebron programme challenged Wageningen UR to obtain at least 10% more natural light in the greenhouse (the winterlight greenhouse). Then the crop must also deal 10% more efficiently with the light, the winter-light crop. Together they form a real challenge. Before planting, we calculated the ‘ideal’ plant distribution in the greenhouse for this variety using the results from earlier trials, and what measures were necessary to achieve that ideal with regard to this crop. The variables concerned were gutter separation, fruits to be retained (pruning of fruit) and the moment to go for the final density. Light distribution and 3D crop growth models assisted with this. Ultimately, the concept must actually be tested in a greenhouse. It was decided to use 3 gutter separations: 1.4, 1.6 and 1.8 meter, all three with the same plant density per m2. In the 1.8 m treatment, there are thus more plants in the row which means, at least theoretically, that in the beginning the plants in the 1.4 m treatment would intercept more light per plant. Despite the relatively short leaves of Hi-Jack, a lot of leaf damage was noted in the 1.4 m treatment incurred during crop tasks. For the test we used the 2SaveEnergyGreenhouse, also known as the glass-film greenhouse. On December 27 the cucumber variety Hi-Jack (Nunhems) was sown with a plant density of 1.67 plant/m2. In weeks 4/6 they were topped, and cultivation continued with two shoots. Thus, we immediately achieved the final density of 3.34 stems/m2. Harvesting started on February 10. In this period as well, the energetic outcomes of this greenhouse concept were reasonable, in which we followed the principles of Next Generation Growing as far as possible. From week 1 to 12 consumption was down 30% compared to the practice; these are figures that catch the attention of the BCO. OCAP-CO2 was also used and we dosed it at 110 kg/ha per hour and have used so far about 1.5 kg CO2. The crop is growing well in general, and when something strange happens, like a round leaf or bent fruit, the response from the BCO is always, “I see that at home, too.” In other words, it’s nothing unusual. We realise that relatively high daily temperatures and the treatments do sometimes produce different crop conditions. Next time we shall know what consequences this will have for the yield, which is now (start of April) around 18 kg. This project is being financed by the Kas als Energiebron programme, the innovation and action programme of LTO Glaskracht Nederland and the Ministry of Economic Affairs.